Unplanned track workout today. Earlier in the day I tweeted I was going out for my first tempo run in a couple of months. A friend replied asking if I wanted to join her for 400m repeats instead. Not going to pass up the chance to do speed work with a buddy! We arranged to meet at the Running Room than did a warm-up jog to the track. We were following a workout that called for 200m sprint followed by 10 squats and 10 sit-ups, then another 200m sprint. Well alright! After that the real fun began. In total I did 8 400m repeats with ’90 second’ rest that was a weee bit longer for a few of them. My friend was having IT band issues and needed to pause to stretch between a couple of them, also water was needed also. It was hot, not awful recent rain had cut down the humidity but still, we were running fast and needed the water! My friend’s IT band got the better of her and I finished the final 3 400’s solo which she took pictures. My 400m averaged 10 seconds faster than they did from just 2 weeks ago! I’m so thrilled and proud of myself and I really put in the work on this session and still felt like I could have done more. But race Saturday I means I’m in a semi taper and don’t want to exhaust myself. Hitting the pool again tomorrow (did last night) and then easy run and some yoga Thursday, rest then race day! It will be my first time racing a 15k so I’m excited for the guaranteed PR! I want to race it but hold back a little bit so I can finish strong and ready to conquer my 10k 10 days after! MY goal is just to finish under 1:30 which I should be good to do. I think I did or was just shy of that during my long run on the weekend! So good sign! It will be a hilly course but I’ve run those hills countless times so I should be able to manage even with a faster pace than usual. Monday I met up with the MEC Burlington meet-up group again. Mondays are different though, they start off with a half hour clinic, topic changes every week. This week was the second part of a talk on threshold running. This is the area I struggle with the most so it was great to get some more intel on the matter. The group is led by one of the staff members who is completing or possibly just finished getting a diploma in health and fitness focusing on running. He himself is some crazy fast runner and he knows a lot, super nice and a great run leader. Really amazing thing MEC does all for free! You normally gotta pay big bucks for this kind of thing. After the talk we head out for a 5-6km run. Since it was a talk all about speed runs, we put that to the test and headed to a park down the street from the store to do intervals. What I was not expecting with this run was the surface. We were running on grass. Some areas the grass was pretty long so you had to pick your knees up, good thing in the end, but certainly made the workout a lot more difficult. I once again proved I’m horrible at pacing myself. For this workout we did 2 laps hard, 1 lap rest, 1 lap hard, half lap rest, half lap hard then took a breather and did it all again. My first lap was fabulous, then it was all downhill from there as I ran out of steam. The grass didn’t help and probably still some residual stiff and soreness hanging around from my half. The next day I was definitely feeling the effects of the run in my hamstrings – or possibly Sunday’s yoga. Either way, kind of now understand why they say it’s not a good idea to do speed work first couple weeks after a race. OH WELL. I twas under 6k anyways. Tuesday I went to a flow class, wasn’t the most challenging class I’ve done but there was some things we did that targeted the hip muscles so I was happy about that. 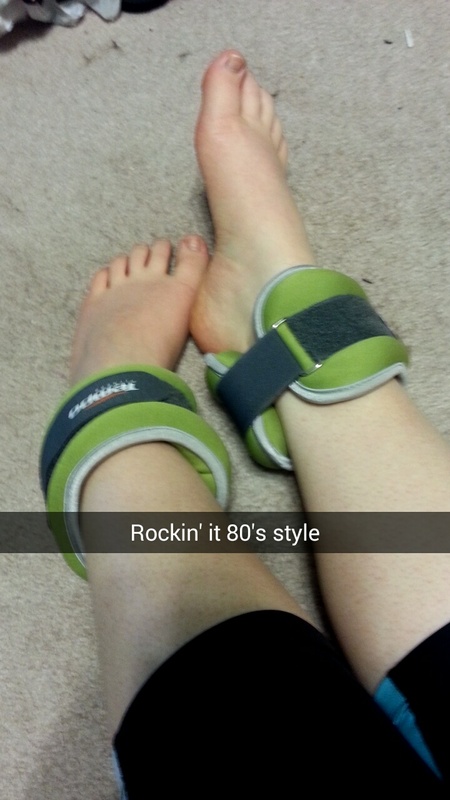 After yoga I did some of my usual hip strengthening moves – side leg raises and such, but added some ankle weights! Man it was so much harder than you think it would be with the little baby weights I had. HUGE difference. 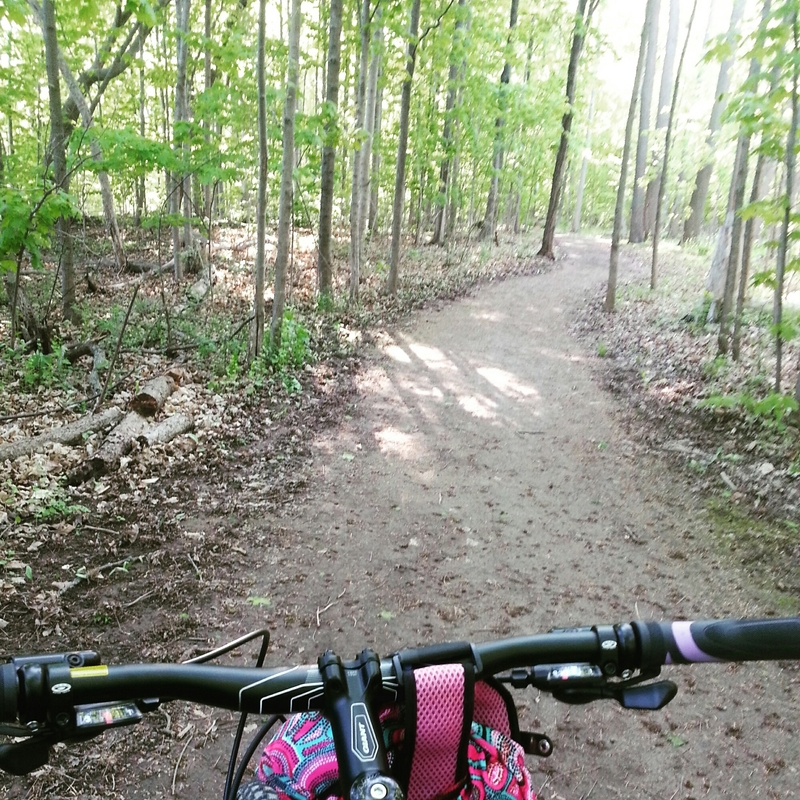 Today I hit the trails! Well more like paths. I have some convenient paths by my work I like to walk at lunch, haven’t done much running on them yet as this is a new job haven’t had much of a chance yet. But today I brought my bike to work with me so I could go for my first proper ride of the year. This is a new bike I just bought a few weeks ago, I took it out for a very short little test ride after I first got it but have really gone for a proper ride since I hadn’t been on a bike since September and didn’t want to get on it so soon before my half. Rode for about an hour, took me longer as I had to stop a couple times to figure out where the heck I was. I don’t know the area and these paths run through residential neighbourhoods so they like to spit you out in different places and sometimes its not easy to find where the entrance is on the other side of the road, if there even is one. Just checked my run keeper app… looks like my route didn’t actually save so that’s pretty annoying, so not sure how far I actually got and I was hoping to use that map to better memorise the paths for runs. Stupid app. Anyways felt great being out on my bike and the weather was great! Perfectly cool, lovely for a bike ride. After that I headed to yoga for some Yin Yang. Yin Yang is my favourite style yoga even though some of the yin stretched are crazy difficult for me. I’m fairly flexible, more so than the average person, but when it comes to seated folds I’m going no where and Yin has a lot of that. It’s an issue I need to work on big time. Anyways fabulous class more rigorous flow portion. My shoulders and back are going to be VERY tight tomorrow after all this yoga, they already were to going into this class. Should be fun! Tomorrow I’ll be joining the MEC Burlington meet-up group for another trail run. Friday I’ll be resting and then 10k race Saturday! Hopefully won’t be too sore by then! haha I’ll try to take it easy tomorrow so my hammies and glutes can heal a bit. No promises though!